Do you think you are a big eater? Show Bistro B what you got! If you fail, you lose $20. If you succeed, you win a $200 gift card. Wow. 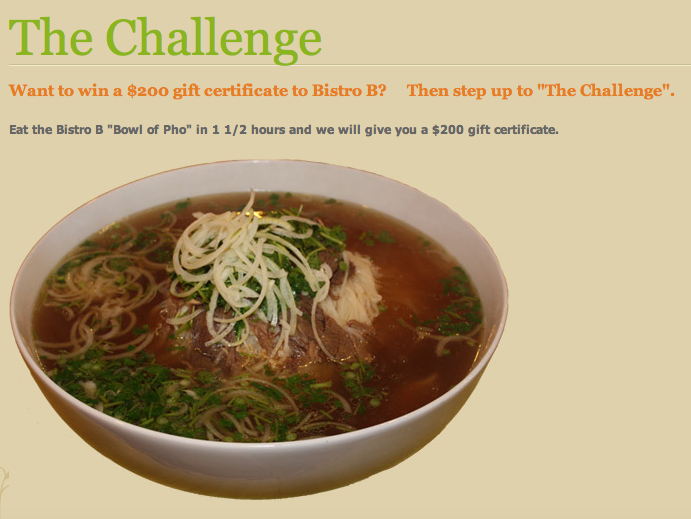 I think I’ll pass on the challenge, but thanks for reminding me that I really need to try Bistro B. I’ve been looking for quality Pho in Dallas. I looked at the photo on the actual Bistro B website and thought I would definitely be able to take it out…but after seeing the yelp picture, all of my hopes were dashed. I would definitely have to bring a friend and just hope that they let us share the $200! I don’t see what was so hard about the Challenge, I ate it in about 25 minutes. And I still ate more, piece of pho cake!